1/2"x 10" x 13 3/8"
1/2" x 7 5/8" x 22"
3/8" x 9 5/16" x 25"
3/4" x 9" x 22"
1 1/2" x 3" x 4 3/4"
3/16" x 1/4" x 5"
1/8" 1/8" x 4 1/2"
1/8" x 1/8" x 1 1/16"
3/16" x 1" x 2 1/2"
1/2" x 7 1/2" x 8 3/4"
1/4" x 3/4" x 9 516"
1/4" x 1" x 26"
3/8" x 3" x 3"
1/16" x 3" x 5 1/2"
1/16" x 4 1/4" x 8"
30# x 18 5/8" x 25 1/2"
3 1/2" x 26 1/2"
Scale door (K), front/back fascia (L), and side fascia (M) to the drawing dimension sizes. This can be accomplished by measuring the print out and dividing that size into the dimension size. This will give a multi-factor that can be used to figure the enlargement size for the patterns. This can be easily done at home if you have a copier capable of making enlargements. If not, most companies that do duplicating can make the enlargements required for the patterns. Trace the pattern enlargements onto poster board or Mylar and use a pair of scissors to cut out the patterns. The lumber required for this project can be cut from a 3/4" x 11" x 15' cedar board. Use a jointer to straighten one edge of the board. Use a radial arm saw to cut off 22" and then rip the board 9" wide for the floor (D). Cut two 3/4" thick pieces 3" wide by 4 3/4" long for the chimney (E). Glue and clamp them together to get the required thickness. After the glue has dried, cut the bottom of the chimney to a 40 degree angle. Plane the remainder of the original board to 1/2". Use a radial arm saw to cut two pieces 22". With a table saw rip the boards 7 5/8" wide for the sides (B). Drill a hole in the center of the window areas on both sides of the mailbox and use a scroll saw to cut out 2" x 4 1/2" openings. Cut another board, 28" long. Rip the board 10" wide. Cut the board into two 13 3/8" long boards. Mark the sides of each board 7 5/16" from one end. From those marks draw lines to the center of the board at the top to form the roof shape. Use a band saw to cut the roof shape. Smooth the edges with a belt sander to complete front/back pieces (A). Plane the remainder of the original board to 3/8". Cut off two boards 25" long and rip them 9 5/16" wide for the roof sheathing (C). Rip the roof crown edge of each roof sheathing 40 degrees. Cut a 2" x 3" piece for the flag (N). Use a scroll saw to cut the flag shape. Plane the remainder of the original board to 1/4". Cut of a board 26" long and rip two pieces 1" wide for the side fascias (M). Rip two pieces 3/4" wide, and cut them into four 13" pieces. Cut a 40 degree angle on one end of each 13" piece and then cut the lengths to 9 5/16" for the front and back fascias (L). Trace the patterns onto the fascia pieces and then use a scroll saw to cut the bottom scalloped shapes. Plane the remainder of the original board to 3/16". Rip pieces 1/4" wide and cut them to the appropriate lengths for the window frames (F) and (G). Rip pieces 1/8" wide and cut them to the appropriate lengths for the shutter frames (J). Rip pieces 1/8" wide and cut them to the appropriate lengths for the window grids (H) and (I). Cut four pieces 3/4" x 2 1/4" and scribe horizontal grooves 1/4" apart to assimilate shutters. Trace the door pattern onto the front (A) and use a scroll saw to cut out the outside shape of the front door (K). Drill a hole in the window portion of the door and use a scroll saw to cut a 7" wide x 3 1/4" high opening. The frame portion of that opening should be 1/4" wide. NOTE: The side window frames and grids, shutters, and the front window frames and grids should be primed and painted on all exterior surfaces prior to attaching them onto the sides and the door. Cut three 1/8" wide window grids for the door window. Cut a 1/16" thick piece of plexi-glass (P) 7 1/2" wide and 4" high. Cut the top of the plexi-glass to the same shape as the top of the door. Cut four pieces of plexi-glass (O) 2 1/2" x 5" for the side windows. Cut six rows of roof shingles 3 1/2" x 26". Also cut two 1" x 26" rows of shingles for the roof cap. Scribe vertical grooves in the shingles to assimilate individual shingles. Hand sand all parts with 120 grit sandpaper. Finish sand all parts with 220 grid sandpaper. Place wood glue on the edges of the floor (D) and use a nail gun with 1 1/4" brads to nail the sides (B) onto the floor. Use 3/8" wood screws to screw the plexi-glass windows (Q) and (P) onto the inside of the sides (B) and the door (K). Use caulking around the plexi-glass to prevent moisture from entering the mailbox. Place glue on the ends of the sides (B) and nail the front (A) and the back B) onto the floor (D) and the sides (B). Place glue on the top edges of the front, back and sides and then nail the roof sheathing (C) onto them. There should be 1 1/2" roof overhang on the front and the back. Caulk the ridge of the roof sheathing. Glue each side window frame (F) and (G) and window grids (H) and (I) together. After the glue has dried glue and nail the windows onto the sides (B). Glue the shutter frames together around the shutter pieces and then glue them onto the sides adjacent to the ends of each window. Nail 1/2" brads into the window frames and the shutter frames to secure them to the sides. Glue the three window grids onto the plexi-glass in the door (K) to form four identical door windows. Glue and nail the chimney (E) onto the roof. Caulk around the base of the chimney. Glue and nail the front/back fascia (L) and the side fascia (M) onto the under side of the roof edges. Use small spring clamps to hold the fascia boards in place during the gluing and nailing procedures. Nail the roofing felt (R) onto the roof. Glue and nail the shingle strips (S) onto the roof. Attach the hinges (Q) onto the door (K) and the front (A). Attach the door knob (T). Attach the flag (N) onto the chimney (E) with a wood screw and a knob (T). Use wood dough to fill all the nail holes, and when dry, sand flush with the surfaces. Use a painter's acrylic latex caulk to caulk all cracks and openings. Apply two coats of latex primer to all surfaces. Apply two coats of exterior latex paint to all surfaces. 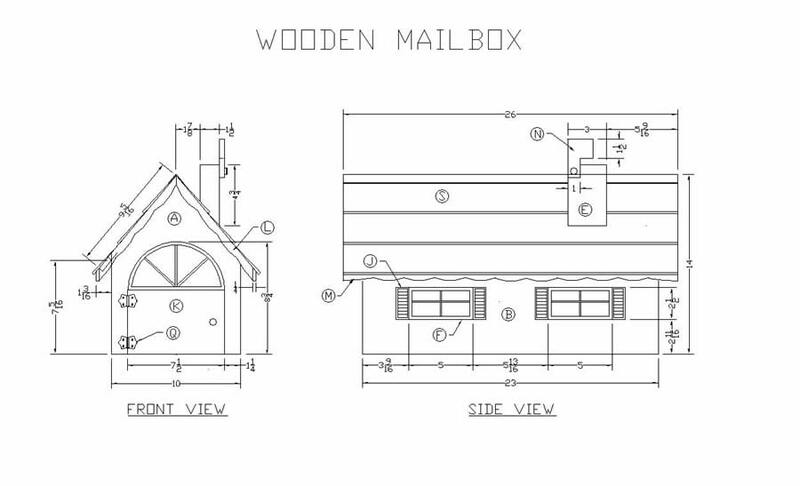 NOTE: The wooden mailbox should be mounted on a post/shelf assembly. Place the mailbox on the shelf and drill four holes from the bottom. Insert stainless steel carriage bolts into the holes from inside the mailbox. Secure the mailbox with a stainless steel washers and hex nuts. 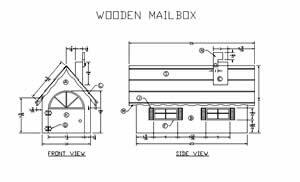 Congratulations, your wooden mailbox is finished and ready to use.